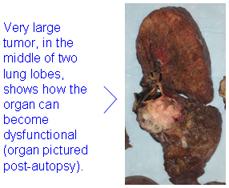 When our body's organs are invaded by malignant tumors they cannot carry out their life-sustaining functions. and death may follow. As cancer cells multiply, the mass of cells eventually forms a malignant tumor and it will reside within human organs such as our lungs or colon. Measurement of tumor size is an important part of cancer diagnosis. As the tumor size becomes larger (as a general rule) treatment of the cancer will become more challenging. Left unchecked a malignant tumor will grow larger and displace more tissue within its resident organ. Before long the organ that has been invaded will become totally dysfunctional and sustaining human life may then become impossible.